Recently Babygrande Records repressed arguably one of the best underground hip hop releases of all time, and one of my all time personal favorites "Legacy of Blood" by Jedi Mind Tricks. Just a brilliant, stunning album from front to finish with some of the most brutal raps over monster beats. This album is truly perfection! I've listened to this thing so much over the years I can receipt every lyric to every song pretty much by now. 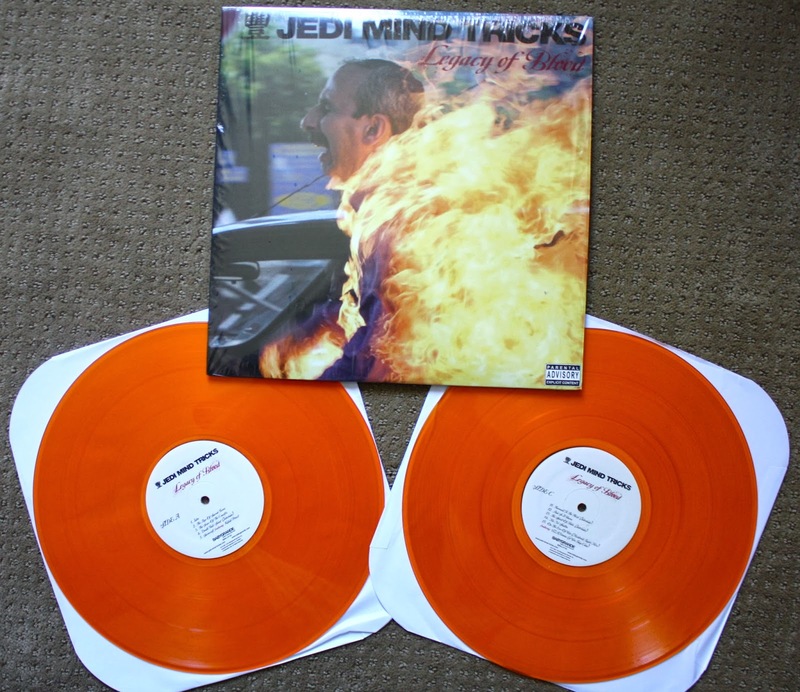 To me, this was Jedi Mind's best release and I don't know if they can ever reach the same level as this one. Above is my original pressing that I got in 2004 on black vinyl. I can't believe it's been almost 10 years since this came out? It just seems like yesterday, and now I'm feeling a bit old just thinking about it. You can see the front and back art appears are a slightly different on the new repress, so for anyone looking to buy one on ebay that is the difference between the old and new copies. Babygrande hit a home run on the new repress with the limited orange vinyl. Goes perfect with the fire on the cover. I don't really know the background behind this picture but that's a pretty wild picture. On the repress the front art appears zoomed in while the back art appears zoomed out. Also the logos/bar code etc moved to the bottom of the back. Check out one of my favorite tracks "Saviorself" feat. Killah Priest. Vinnie dropping some serious history lessons over a Spanish guitar inspired beat. "This is war rap similar to Jacob's Ladder, walk around like Thor with the sacred hammer... and you don't really want the guns out, we some vampire motherfuckers burn when the suns out."